John Everett Millais had Ewell friends in the Lemprieres, who like the Millais family, had come to England from Jersey. As a boy, Millais stayed with Captain Lempriere and his large family in Cheam Road. The Manor House, which stood where Staneway turns out of Cheam Road, was one of the largest houses in Ewell. 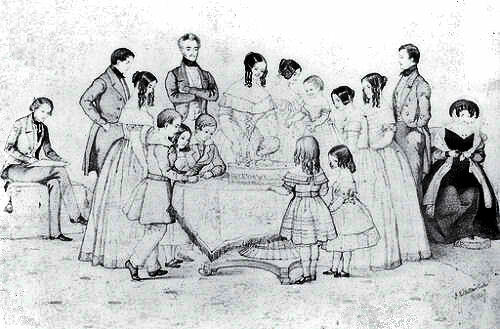 Millais made a record of this family life in two drawings. One is a rough sketch of the family watching Harriet cutting a twelfth night cake; Mary has her pull-along horse on the bare floorboards while the family dog sits waiting for a titbit. The other is a more worked-up version; it shows the family in a more formal way and was possibly done as a gift for them.